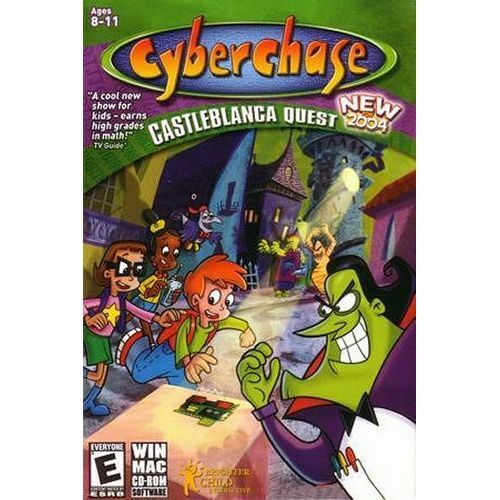 Buy Cyberchase: Castleblanca Quest for PC in India at the best price. Screenshots, videos, reviews available. Scary Scales: Mummies need to get into their favorite restaurant via the back door. You must help them by making them drop through trap doors onto either side of a large scale. Each mummy is assigned a weight and when the scale becomes more or less balanced, the mummies may enter the restaurant. Goop Zapper: Help the goop factory package frozen goop for shipment. Pull a lever to drop a block of goop onto a conveyor belt and configure the zapper ray to either grow or shrink the block to the optimal size for the crate in which it is to be shipped. Monster Dive: You are presented with a tank with a low volume of water. Monsters will be diving into the tank and you are told what level of water they need. Your task is to place enough other monsters in the water to displace enough water to reach the required level. Get The Lead Out: 2 Alchemists want to evenly divide a quantity of lead between them so they can turn it into gold. Use glasses of water to divide the lead by observing the amount of water that each quantity displaces. Lights Out: You must close all the blinds in the castle so that Dracula can get out of his coffin. Configure the angle and distance to throw your grappling hook to bring down the shades. Disco Deflector: Change the angles of a series of wall-mounted mirrors so that when a beam of light is fired from one wall in the dance hall, the light makes its way to the disco ball so that the monster dance party can start. Haunting Hang Gliders: Help guide a monster's hang glider over a short course by dodging obstacles. After profiling a short flight, use that time to evaluate how long it would take to complete a longer flight. Drape Maker: Use the tools available (ruler, string, fabric, and basic math operations) to create properly sized drapes for different sized windows.